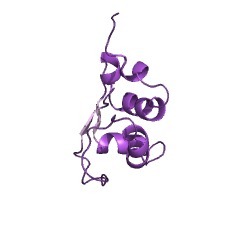 This domain is found both alone and at the C-terminus of actin-binding Rho-activating protein (ABRA). It binds to actin, and in muscle regulates the actin cytoskeleton and cell motility PMID:11983702, 20940261. It has a winged helix-like fold consisting of three alpha-helices and four antiparallel beta strands. Unlike typical winged helix proteins it does not bind to DNA, but contains a hydrophobic groove which may be responsible for interaction with other proteins PMID:21082705 . This domain is found both alone (in the costars family of proteins) and at the C terminus of actin-binding Rho-activating protein (ABRA). It binds to actin, and in muscle regulates the actin cytoskeleton and cell motility [(PUBMED:11983702), (PUBMED:20940261)]. It has a winged helix-like fold consisting of three alpha-helices and four antiparallel beta strands. Unlike typical winged helix proteins it does not bind to DNA, but contains a hydrophobic groove which may be responsible for interaction with other proteins [(PUBMED:21082705)]. There are 1244 Costars domains in 1240 proteins in SMART's nrdb database. Taxonomic distribution of proteins containing Costars domain. This tree includes only several representative species. The complete taxonomic breakdown of all proteins with Costars domain is also avaliable. Click on the protein counts, or double click on taxonomic names to display all proteins containing Costars domain in the selected taxonomic class. Solution structure of the human HSPC280 protein. The human HSPC280 protein belongs to a new family of low molecular weightproteins, which is only present in eukaryotes, and is absent in fungi. Thesolution structure of HSPC280 was determined using multidimensional NMRspectroscopy. The overall structure consists of three alpha-helices and fourantiparallel beta-strands and has a winged helix-like fold. However, HEPC280 isnot a typical DNA-binding winged helix protein in that it lacks DNA-bindingactivity. 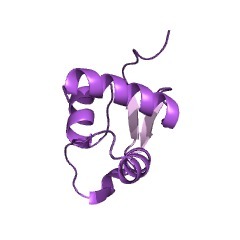 Unlike most winged-helix proteins, HSPC280 has an unusually long13-residue (P62-V74) wing 1 loop connecting the beta3 and beta4 strands of theprotein. Molecules of HSPC280 have a positively charged surface on one side and anegatively charged surface on the other side of the protein structure.Comparisons with the C-terminal 80-residue domain of proteins in the Abra family reveal a conserved hydrophobic groove in the HSPC280 family, which may allowHSPC280 to interact with other proteins. Costars, a Dictyostelium protein similar to the C-terminal domain of STARS,regulates the actin cytoskeleton and motility. Through analysis of a chemotaxis mutant obtained from a genetic screen inDictyostelium discoideum, we have identified a new gene involved in regulatingcell migration and have named it costars (cosA). The 82 amino acid Costarsprotein sequence appears highly conserved among diverse species, andsignificantly resembles the C-terminal region of the striated muscle activator ofRho signaling (STARS), a mammalian protein that regulates the serum responsefactor transcriptional activity through actin binding and Rho GTPase activation. The cosA-null (cosA(-)) cells formed smooth plaques on bacterial lawns, produced abnormally small fruiting bodies when developed on the non-nutrient agar anddisplayed reduced migration towards the cAMP source in chemotactic assays.Analysis of cell motion in cAMP gradients revealed decreased speed butwild-type-like directional persistence of cosA(-) cells, suggesting a defect inthe cellular machinery for motility rather than for chemotactic orientation.Consistent with this notion, cosA(-) cells exhibited changes in the actincytoskeleton, showing aberrant distribution of F-actin in fluorescence cellstaining and an increased amount of cytoskeleton-associated actin. Excessivepseudopod formation was also noted in cosA(-) cells facing chemoattractantgradients. Expressing cosA or its human counterpart mCostars eliminatedabnormalities of cosA(-) cells. Together, our results highlight a role forCostars in modulating actin dynamics and cell motility. STARS, a striated muscle activator of Rho signaling and serum responsefactor-dependent transcription. Changes in actin dynamics influence diverse cellular processes and couple theactin-based cytoskeleton to changes in gene transcription. Members of the RhoGTPase family regulate cytoskeletal organization by stimulating actinpolymerization and stress fiber formation when activated by extracellularsignaling. The transcriptional activity of serum response factor (SRF) isstimulated in response to changes in actin dynamics and Rho signaling, but theproteins that mediate this phenomenon have not been fully identified. We describea novel, evolutionarily conserved actin-binding protein, called STARS (striatedmuscle activator of Rho signaling), that is expressed specifically in cardiac andskeletal muscle cells. STARS binds to the I-band of the sarcomere and to actinfilaments in transfected cells, where it activates Rho-signaling events. STARSstimulates the transcriptional activity of SRF through a mechanism that requires actin binding and involves Rho GTPase activation. STARS provides a potentialmechanism for specifically enhancing Rho-dependent transcription in muscle cells and for linking changes in actin dynamics to gene transcription.